This paper provides an update on recent significant advances in our understanding of climate change across the Antarctic continent and the Southern Ocean, and the impacts on the terrestrial and marine biota. 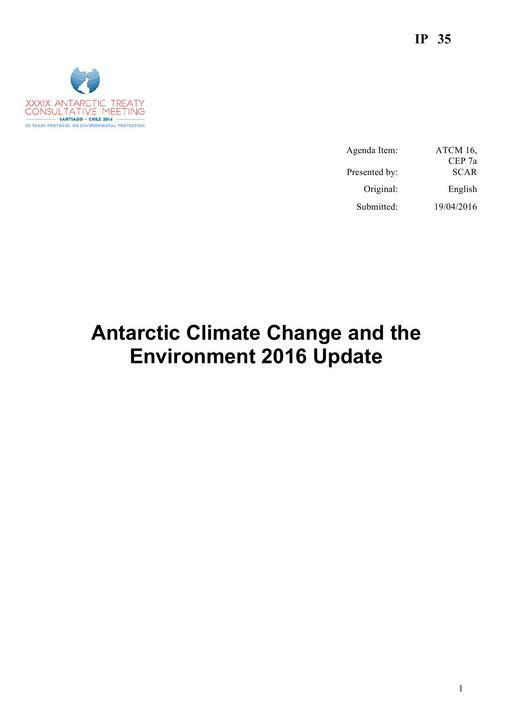 It builds on material included in the Antarctic Climate Change and the Environment (ACCE) report, which was published by SCAR in 2009 (Turner et al., 2009), with an update of the key points appearing in 2013 (Turner et al., 2013). At the request of the ATCM, SCAR agreed to provide regular updates on the original report (e.g. ATCM Resolution 4 (2010)) and that activity is coordinated by the SCAR ACCE Advisory Group. The scope of the group is to keep abreast of recent advances in climate science, with a particular focus on Antarctic climate change and the biological implications of such changes. The paper highlights changes changes in the Antarctic physical environment and in the Antarctic biological environment.